The Hoover Dam and Grand Canyon are so close to Vegas, you need to add these destinations when you plan a trip to Las Vegas. That way, you can enjoy a Grand Canyon tour from Las Vegas, and make the most of your whole travel experience. By taking this approach, you will love your Vegas trip, given its diversity. While you can experience the glamor and lights at night, you can get an awe-inspiring fill of magnificent scenery in the day. Who do you choose to take you to the Canyon’s heights? We are glad you asked. 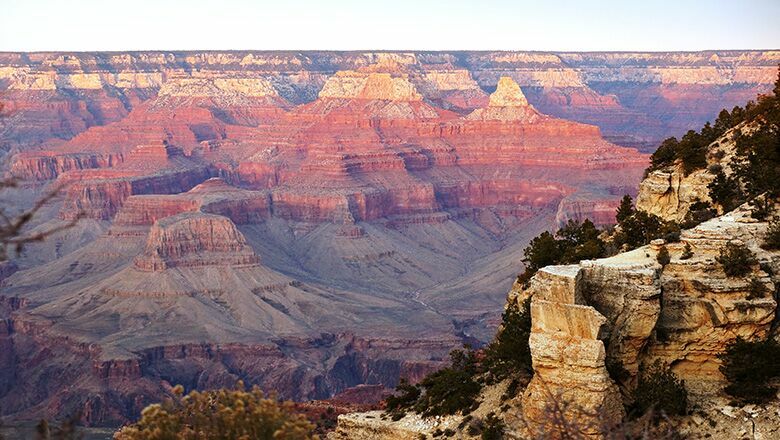 Here, at Grand Canyon Destinations, we make travel fun and exciting. Our trusted fleet of luxury buses enable passengers to sit and lie back while enjoying the incredible scenery. Enjoy amenities, such as adjustable seating, individually control air condition, and panoramic windows on your journey. Our buses are also equipped with onboard unisex restrooms. Not only that, we provide on-time pickups from passenger hotels. People love to take Vegas and Grand Canyon tours with us because we provide guides for direction. That way, you can learn more about the gemstones you will find in the form of information on your Grand Canyon trip. In fact, a Grand Canyon tour from Las Vegas trips gives you a lot of information about the natural habitats, culture, and manmade inventions, such as the Hoover Dam. You can find all these sights during stop-overs during your luxury bus trip. You simply do not have this kind of latitude if you choose to travel by car. No doubt about it – Vegas attracts all kinds of visitors from all over the world. Given the excitement of the city, it is easy to understand why. That is why you need to include a Grand Canyon trip on your next Vegas vacation. By taking this approach, you can enjoy a nice mix of excitement – combine the glitz and glamor of the strip with beautiful natural sites nearby. By choosing Grand Canyon Destinations to guide you on your next journey, you will enjoy the height of comfort on you Grand Canyon to Las Vegas trip. Our premier bus service and small tour group company will give you all the amenities needed to make your exploration of the Southwest a memorable event. When you arrive at the Canyon, you will se sites, such as the South Rim, the Skywalk at the West Rim, and stop at the Hoover Dam and Lake Mead at the beginning of the trip. Start learning more about the trips we offer today online. When you travel from Vegas to the Grand Canyon, you will make your Vegas trip all that more special. We can answer your questions about our trips, and help you plan a daytrip you will want to add to your bucket list. © Grand Canyon Destinations. All rights reserved.